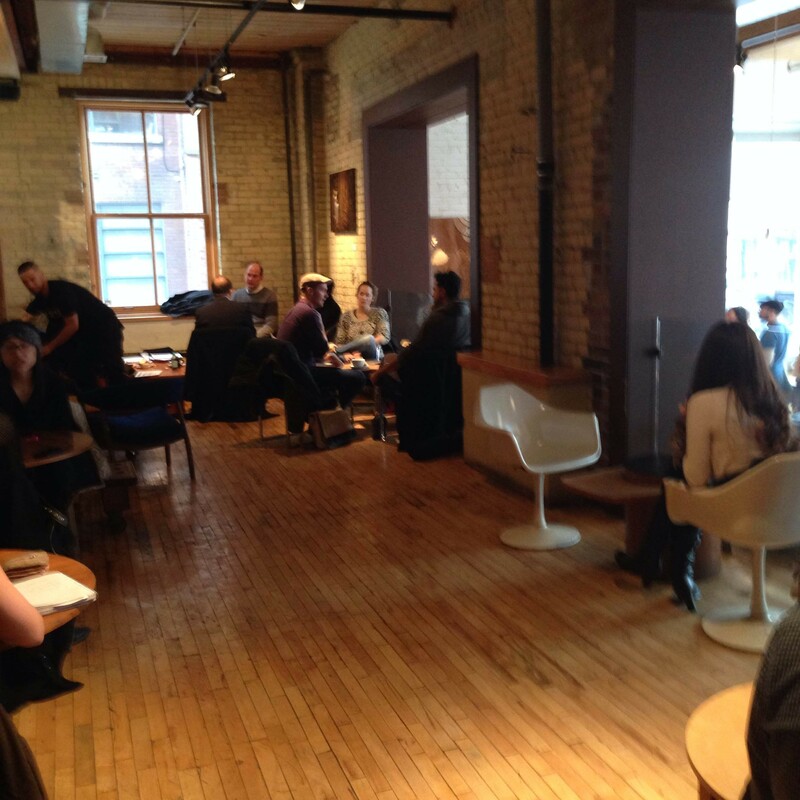 Dark Horse Espresso Bar on Spadina, in the heart of Toronto’s high tech hub, is, for me, the ultimate example of space as a networking tool. Sit here here for any amount of time, and you will hear conversations that sound like they’re probably interviews, descriptions of apps in progress, friends of friends recognizing each other across the table and showing off portfolios, and all kinds of casual discussions about trends, sales strategies, developments, and news. The person next to me is on skype. I’m sitting here as I write this, in fact, and I almost feel like I’ve dropped in on some hip new office. This is a space where work gets done. People don’t come here just to hang out; they come here to make the world a better place. Possibly in part because the high tech sector is so flexible and full of tiny start ups that may not have offices of their own, or freelancers who want to feel part of the larger world from time to time. Or because so many businesses can benefit from connecting with each other, so a place like this acts as a living room for a busy, sprawling blended family. For all of these reasons, I think it’s an interesting space to look at with the eyes of a librarian. Because we don’t tend to build spaces like this. Right up at the front of the place, up by the front doors, are two large communal tables. They are so big that you can’t take over one of them yourself. So no one does. The culture of the place doesn’t allow that. You sit down next to people you don’t know, because that’s how it works. 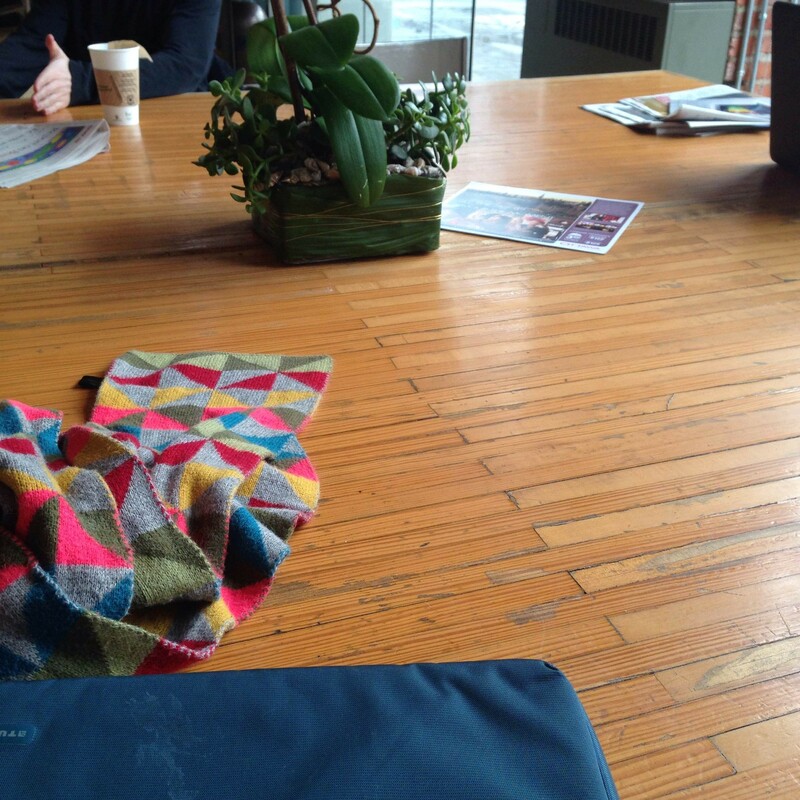 I’ve spent a lot of time looking at communal tables and puzzling over them. I suppose that’s another post in itself, really; communal tables are very appealing, but very, very tricky. There is a direct and critical relationship between the social culture of a space and the physical dimensions of the furniture that can make a communal table succeed or fail, and the mathematics of predicting that are well beyond me. Where a culture allows a thinner table to be used communally, making it okay for strangers to sit close to each other in public, then a thin table can be shared by strangers and succeed. But strangers tend to be shy to varying degrees, and if that culture of space sharing and reduced personal space isn’t already there and understood, a communal table has to be much wider. I suspect you can graph the anxiety and shyness of your target population, the degree to which they understand the social culture of the space into which they’re stepping, the amount of space around each chair, and the width of a communal table and get a formula out of this. I’m pretty sure there’s a science to this. This communal table at Dark Horse is very wide. It’s a square, in fact. You’d think, if you’re a space planner trying to get as many bums in seats as possible, that it’s a bit of a waste of space. No one’s using the middle of this table. But that space is what enforces the social culture of Dark Horse. You can’t carry on a conversation with the people on the other side of it. It’s too wide. This is, for me, the ultimate shared table. This is furniture that doesn’t negotiate. It’s not your table. It’s where we all sit, and we all do what we need to do. Sometimes that’s a conversation with the person next to us. Sometimes it’s a group of people sitting with computers open. Sometimes someone’s going to take out a phone and start a conversation. All these things are okay around the communal table, because while the purposes for being here are all different, the people around this table are opting in to sharing space this way. And feeling connected to strangers. If you’re interested in communal tables, Dark Horse will be my first recommendation for a visit. It’s not the only one, but it’s the most relentlessly sharable one. The image in my head of Dark Horse is so dominated by these communal tables that I actually failed to notice in my first two visits here that there is more space than this. 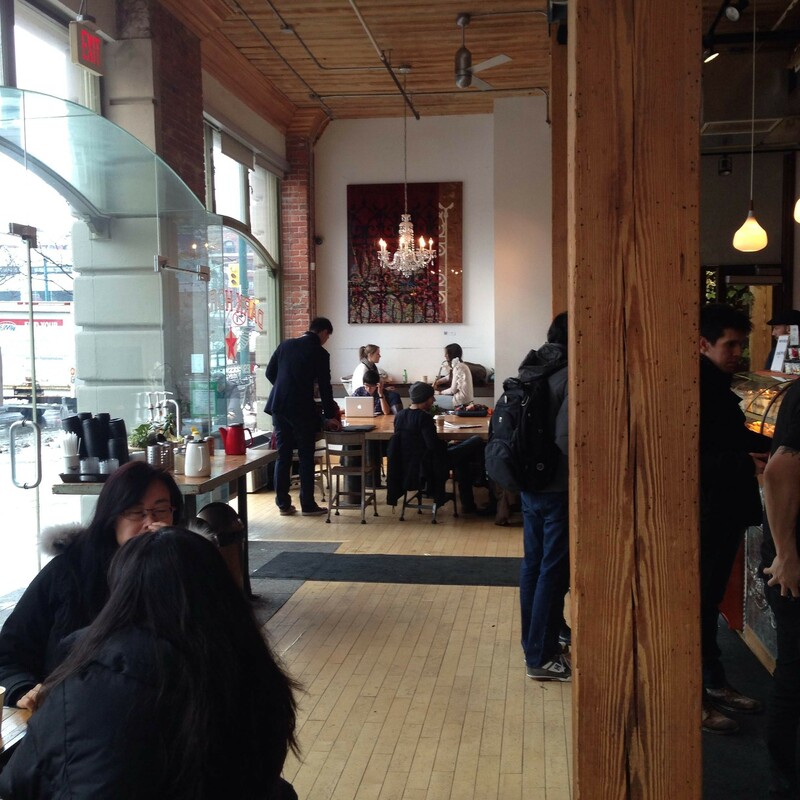 A few steps up on the other side of the espresso bar, there’s an area for different kinds of interaction. Some small tables that can seat two, but are currently taken over but individuals within open laptops, a space for four or five, and a few spaces for groups of three, with lower tables. These are spaces that insist that you not sit there with a laptop. These are conversational areas. And they are in use as conversation areas: I think I walked through a business meeting when I went in to snap these pics. Sorry about the quality. I’m trying not to interrupt anyone. I’m always interested in spaces that are not quiet but get used as space for individual work. You could work at home. you could hole up in a library (that’s certainly cheaper). People are going to chat and laugh around you. On the way here today there were only three people on my car on the train, and one of them was on his phone making business calls for the entire trip. It drove me (trying to write over here) and the car’s only other passenger (trying to read my novel, thanks) absolutely nuts. But when you step into a place like this, you don’t expect silence. So it doesn’t bother you. Isn’t that strange? It’s less about sensitivity to noise and more about expectation. There’s something that appeals to people about working in a noisy, active, busy place like this. 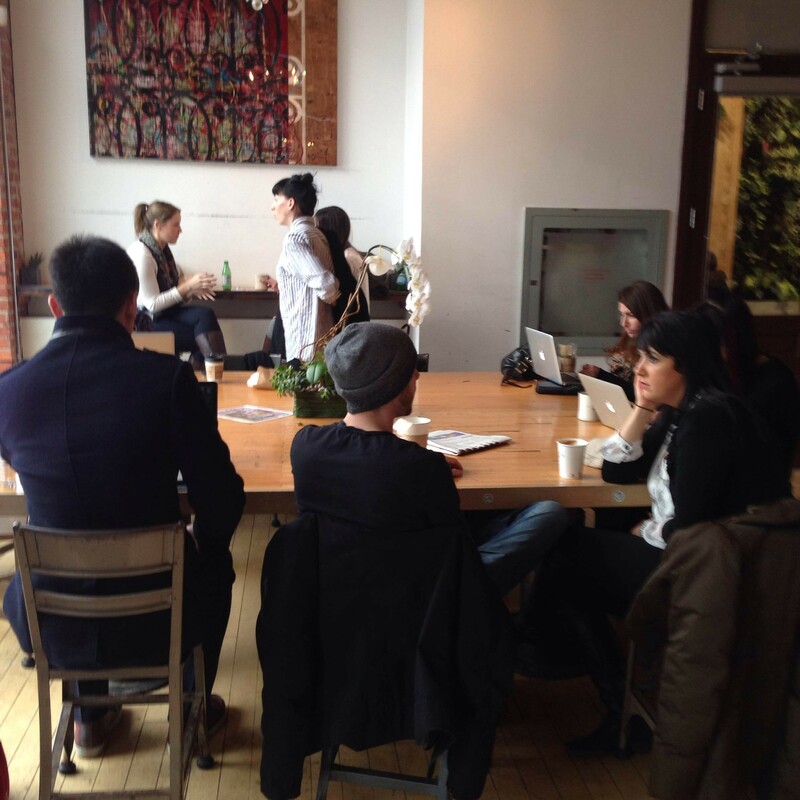 You’re in the heart of a hip neighbourhood, someone you want to connect with might drop in at any time, you’re around a lot of creative and passionate people. You make a statement when you work in an place like this. It’s a statement about availability, about what you think is important, and about who you think you are. Those conversations going on around you might change your life. I’ve started to understand that most things we do are about self-identity, and the spaces we chose to frequent are very much a part of that process. Libraries are part of that equation as well, though we rarely frame them that way. It would be interesting to look at library spaces with an eye to what we’re helping patrons say about themselves to themselves and others. I think, in the end, it’s thinking that way that makes a space a social force. 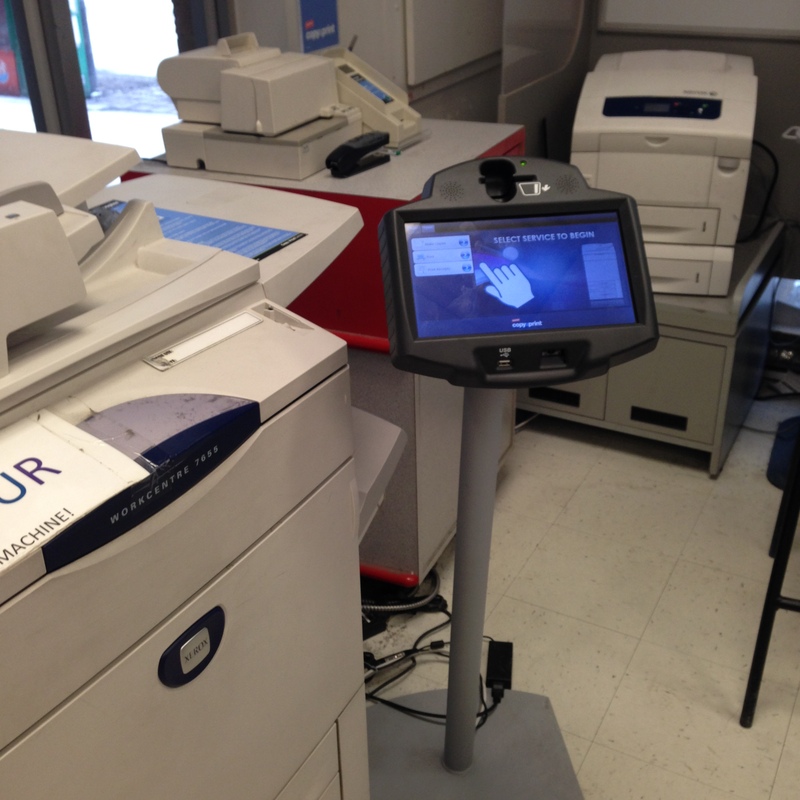 Very often, when we consider where in our libraries patrons will need to use digital materials, we add a station like this one. This is a terminal at the University of London Senate House Library. It’s placed helpfully in the stacks, near study areas. Like most such terminals, the point is probably to give students access to the catalogue while they’re browsing for physical materials and not very much more. It’s not a spot where you can sit down and spread out. There were other, better places to work on a paper or study. It’s exactly the kind of set up you see in most libraries of any description. I understand why we do this. We’re coming from a good place. We want our patrons to feel comfortable. We want them to never be limited by the lack of a keyboard. Even if the catalogue can be browsed quite easily on a touch screen, what if you need to do something that requires sustained typing? I understand the impulse to account for every possible need within a rational budget. It’s logical, and thoughtful, and it’s technically open to changing needs and contexts. You can see how we think digital material is going to be used: alone. Not with a group of students, not with help from a librarian or a TA. Interacting with digital media, in this context, is very much an independent exercise. 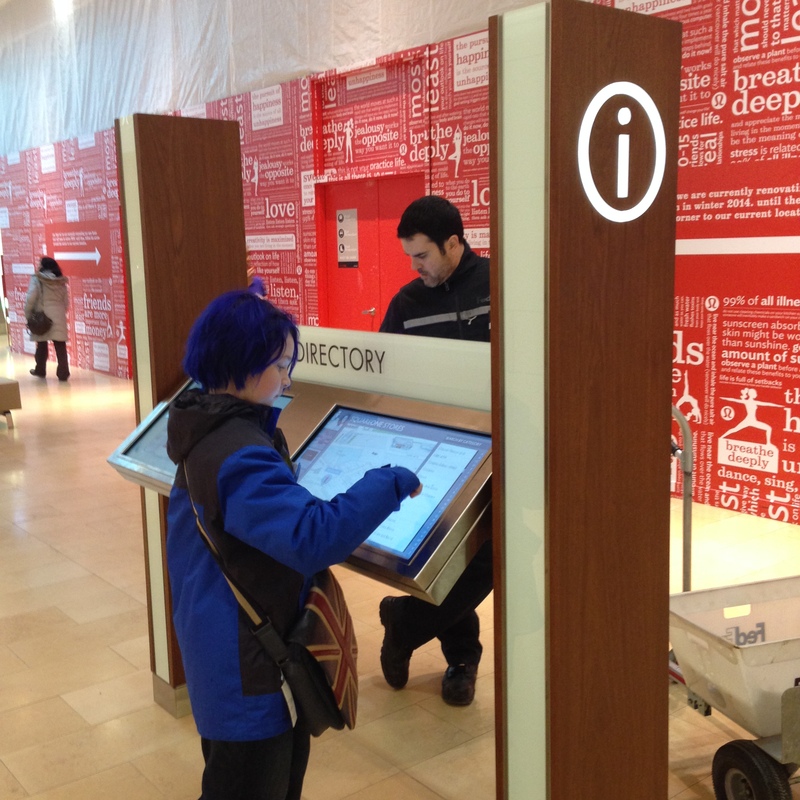 This is the interactive mall directory at Square One, Mississauga. (And that handsome devil is my nephew, Max.) No keyboards, no mouse. Just a clearly designated directory. You can’t plonk down here and check your email, it’s true. You can’t write an essay on it. But you can work out where you’re going, and find out what this particular mall has in store for you. You can also walk up to it with your friend (or, as Max did, with your crazy aunt who takes photos and videos of odd things). This is Max doing some fake navigation for me so I could film it. The downside of these things is that, at this point, you need to pay someone to create the digital materials for you to display like this. After years of static, keyboard-and-mouse based input, the easiest systems don’t respond as well to touch-based devices and interfaces. But that’s changing, and will continue to change with the rise of tablets and other larger-format touch-based interfaces. 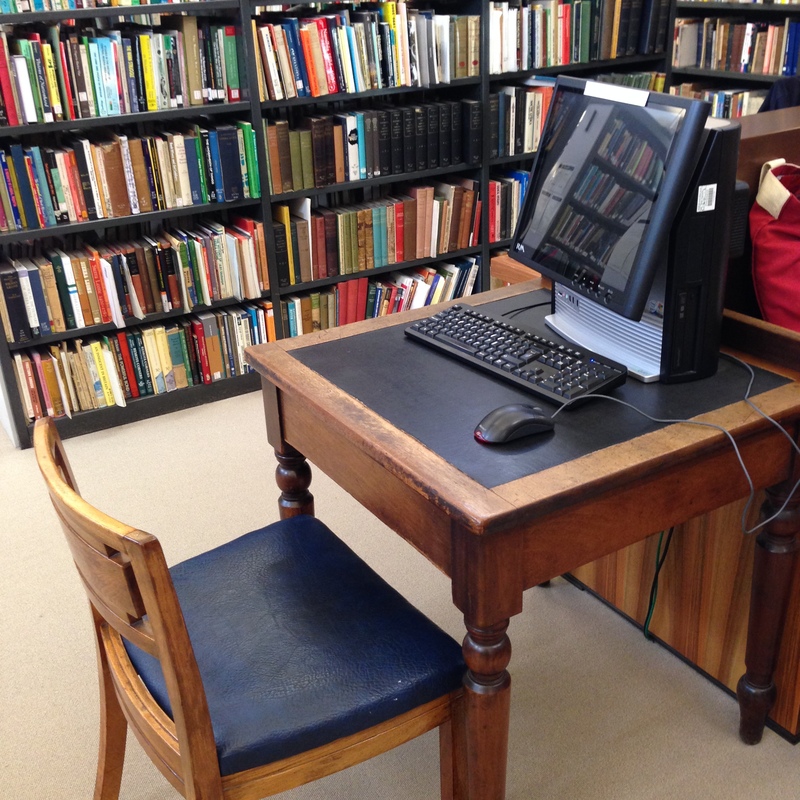 There is increasingly few technical reasons why libraries can’t provide catalogue and information access points that look less like the workstation above and more like what Square One is doing. Here’s some interactive screens at the Disney Store in the Eaton’s Centre, Toronto. The focus is primarily on the projected film on the wall, but there’s associated information showing on the two screens that flank it. Since this area is for children, the screens are smaller, slower, and primarily graphics-based. I think this is really interesting, mostly because Disney surely knows that the children in this store are bound to be incredibly distracted. There’s input coming at them everywhere. The store is full of toys. There’s a cartoon playing on the wall. But they integrated screens at the right level for their audience, and integrated it so that it’s not distracting from the purpose of being there, but adding to it. These children don’t need to turn away from what they’re doing to see the digital material. It’s part of the experience. And it’s a part of the experience that doesn’t dictate how many people can gather around it at once. This is a screen that controls the printers at Staples just off Dundas Square in Toronto. Again, no keyboard, no mouse. Like some of the stellar digital terminals at M&S in London, this machine takes a card for payment. It’s low profile, small footprint screen that doesn’t require a desk at all. This Staples doesn’t really have room for a desk. Sometimes necessity breeds some good ideas. I mean, it’s not pretty, but it’s computing in a tight space, without setting up a whole independent workstation. It’s set up for people who are there to do a single thing and want to get it done quickly; that’s a goal a lot of library patrons can identify with. This is a terminal at the Google co-working space in London. Because it’s a fairly noisy spot, there are a variety of noise-cancelling and relaxation-type areas. 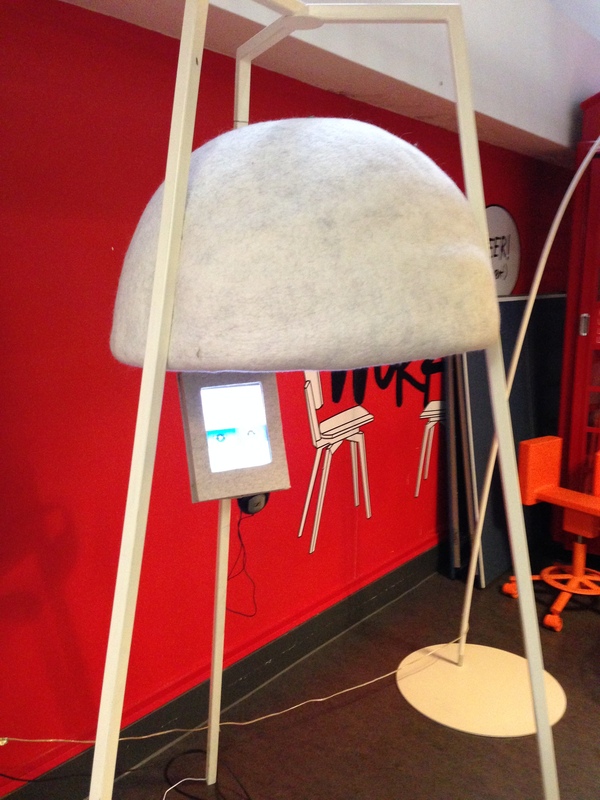 This pod digitally delivers information while the user is in this audio-limited environment. Digital material, as you can see, is the least complicated part of it. Looking around and seeing the variety of ways that digital material can delivered at point of need that doesn’t involve a chair, a keyboard, a mouse and a monitor is an important reminder to me. We shouldn’t assume that digital material can only be consumed in one physical way.